Buying a scissor lift or boom lift so your employees can safely reach high places may seem like a natural choice, but think carefully about your decision before reaching for the credit card. There are some compelling reasons why renting this heavy equipment makes more sense. Buying a new lift can take a big chunk out of your business budget. Scissor lifts usually cost between $10,000 and $15,000. Larger models sell for as much as $50,000. A standard 30- to 40-foot boom lift costs between $25,000 to $75,000. Even if you buy used, you could still expect to pay $20,000 to $40,000. If you need a large boom lift, expect to pay $100,000 to $200,000 brand new. Can your company afford to pay that much? Does it want to? Lift rentals are much cheaper. 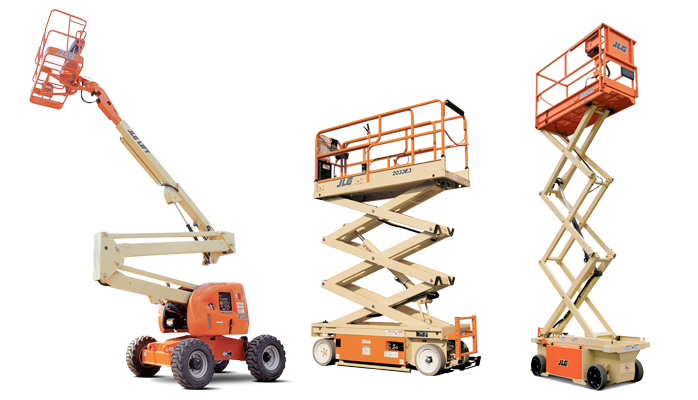 Scissor lift rentals usually cost between $100 and $150 a day. Weekly rates typically range from $350 to $500. Expect to pay between $250 and $400 a day for a boom lift. Good rental firms offer reduced weekly rates of between $1,000 and $1,500. Some companies like BigRentz also offer special monthly rates. Such dramatic price differences make renting a great option for businesses on a budget. It improves cash flow and helps companies invest in a variety of areas. When you spend so much on a boom lift or scissor lift, you probably won’t want to replace it quickly. However, there’s nothing like enjoying a brand-new piece of equipment. Lift manufacturers refine their products all the time, making them safer, more user-friendly, eco-friendlier, and more efficient. Rental companies purchase new equipment regularly to maintain their competitive edge. Rent to enjoy the benefits of new technology without paying more. Upfront fees aren’t all to consider when crunching the numbers. When you own your lifts, you must maintain them for safe operation and longevity. You’ll also pay for repairs if they fail. Renting can reduce these costs or even eliminate them entirely. You might pay for maintenance on a long-term rental, depending on your contract’s terms. In most cases though, maintenance is the rental company’s concern. Unless you’re at fault, you won’t pay for lift repairs either. The thought of ongoing rental costs can deter businesses from renting equipment. However, maintenance and repair are an ongoing responsibility that renters rarely worry about. The moment you buy a new lift, you’ve lost money. Remember that used standard boom lifts can cost around $35,000 less than new models. Scissor lifts also lose value. Those losses can be very frustrating, especially if you’re only using the lifts now and again. The longer you hold on to equipment, the harder it is to recoup its value and the more you’ll spend on maintenance and repairs. You won’t have to worry about this depreciation when you rent though. Owning your own boom lifts and scissor lifts can be a logistical headache. While lifts can spend a little time outdoors, you’ll eventually need somewhere to store them safely when they’re not in use. Finding this space can be difficult, especially for small businesses and companies based in urban areas. Storage isn’t something renters really worry about. They’re only storing the lifts for a short time, if at all, so they don’t need a permanent solution. If you own your own lifts, you’ll need to move them from your storage facility to your job site. Transporting lifts takes time, and in the business world time is money. While your workers wait on the lift’s arrival, productivity suffers. When you rent lifts, your rental company takes care of the transport. Quality rental companies like BigRentz have proven transport procedures to reduce delays. Your business plans might help you predict what’s ahead, but no one can see into the future. Renting helps you be more flexible with any changes in the business. If your business enjoys a boom period, you can rent more lifts. You could even rent equipment on the other side of the country if your business expands. In slow patches, you might reduce your fleet or stop renting completely. You can also choose different equipment models or types depending on the work you receive and your business budget. The possibilities are endless. If you want to learn more about renting heavy equipment or start renting today, visit BigRentz.com. Organize your rental online to enjoy a generous 20 percent discount on the delivery and pick up price.